On March 9th the Millet Fire Department, and what seemed like the entire rest of the town, packed the Millet Agriplex to hand out awards, enjoy some fabulous food, and finally dance the night away with friends and loved ones. The room also had it's full quota of dignitaries and politicians wanting to express their appreciation to the hardworking volunteers of the MFD. The evening opened with a piper leading the whole department down the center of the room where they split into two lines to form an honour guard walkway. Retired Fire Chief Al Kilborn was very surprised and touched to learn that this ceremony was to acknowledge him for receiving the Queen's Diamond Jubilee Medal last fall. He walked down the aisle created by the firefighters to the head of the room where he was presented with a certificate in honour of his achievement by MLA Verlyn Olsen and Mayor Rob Lorenson. After the official presentation a young woman came forward to lead the crowd in singing God Save The Queen. When she was finished the song the young lady threw her arms around Al and said "Congratulations! You deserve it grandpa!" to a chorus of ahs and chuckles from the audience. From there, the emcee for the evening, Firefighter Trevor Palmer, got everyone into the groove with his jokes, quips and original poetry, while a slide show of MFD photos both old and new ran in the background. The fabulous buffet dinner was catered by the Millet Skillet and included buns, salads, pickles, steamed carrots and beans, roast beef and a heavenly chicken in mushroom sauce. To top the meal off was an outstanding dessert table featuring the Millet Skillet's almost-world-famous homemade cinnamon buns. It was a tribute to the quality of the food that there was almost none left to clean up at the end of the meal. Once everyone's hunger was satisfied the ball got rolling with the presentation of the Department's yearly awards. 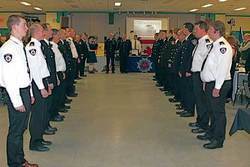 The first round of awards were given to five Millet firemen who received their Alberta Emergency Services Medals for twelve years of service. The next series of men to be honoured were a group of six firefighters who received their rookie, 1 year, five year, and ten year pins. Then, Chief Mohr and former Chief Kilborn made a special presentation of a plaque to Captain Roy Elderkin, who had served an impressive 40 years with the Millet Fire Department. As the final "serious" award of the night, four firefighters had their names placed on the perfect attendance plaque for never missing a practice night during the preceding year. Then the fun truly began with a slide show of photos and stories chronicling the MFD's notorious 2013 "Boys Of The MFD" calendar that they put together last year as a fundraiser for the department. This was the point during the evening that Millet's Mayor Rob Lorenson and the Town's Assistant CAO Lisa Schoening came forward to present a brand new award to one of Millet's finest. They called the award the "Expose Your Hose" award, which went to the "chosen model" in the calendar. This winner of the award was "Calendar Boy" Captain Ron Brown, who walked up to the podium to a chorus of "Brownie! Brownie!" chanted by the other firefighters. He accepted the award with a fist pump in the air and a big smile as he shouted "Skin to win!" Much to the delight of the crowd. The next award was the Parson's Double Clutch Award, which consisted of part of a clutch mechanism from one of their trucks, mounted on a plaque, that a firefighter named Parson had destroyed. This award is given to a firefighter that had rendered a piece of equipment inoperable during the past year. The Cap'n Crunch Award, which consists of a box of Cap'n Crunch Cereal mounted on a plaque, is given to a firefighter who damages a piece of fire hall equipment, which, Trevor stated with an ironic smile, is usually one of the trucks. Mostly because, he pointed out with a laugh, this is the perfect career for people who like to ignore the speed limit, stop signs, and most other Alberta highway act legislations! Retired Chief Kilborn was teased that this was practically a lifetime award for him as he has even managed to damage a fire truck that didn't belong to Millet! The final award of the night was the Golden Chain Award which is given to any firefighter who has attempted to tow another vehicle and gotten the fire truck stuck in the process. It was decided to give this award to the entire department, because, in the words of former Chief Kilborn, "As a driver, if you weren't stuck on a scene in the last 12 months you were doing it wrong!" Once the presentations were over and the laughter died down, Trevor took a few moments to redirect the crowd's thoughts to more serious topics. First he raised all the glasses in the room to a toast to all the firefighter's wives, who also give up a portion of their lives that their husbands and significant others can protect their community. And then he made notice of the table set at the front of the room which was set with two places, and two empty chairs with helmets placed on top of them. This was a memorial table set up to remember Fire Investigator Brian Monahan, and Captain Larry Bowering, who had recently passed away. Trevor then posed the question to everyone, "What if volunteer firefighters didn't volunteer?" He spoke for a minute or two on how much the people involved in this job love their chosen career, their community, and find it almost impossible to step away from it once they have begun. He finished by thanking the residents and municipalities of Millet, Wetaskiwin, and the County of Leduc for the support that they have given to the Millet Fire Department over the years. With the formalities finished, the night was handed over to the band Bella Rouge to rock the night away. Bella Rouge consists of two sisters from Millet, Jenesse and Brittany Graling, and their friend of many years from Sherwood Park, Kelly Nall, with a talented group of musicians that back them up. Playing songs from a wide range of artists including Aretha Franklin, Abba, and Adele, these vocally flexible ladies had the crowd on the dance floor right out of the gate. The evening was a resounding success with everyone having a ton of fun, and also raising some money for the Millet Fire Department at the same time. It just goes to show that as hard as firefighters work at their job, they work just as hard at having fun!